Americas gateway to the universe. Leading the world in preparing and launching missions to Earth and beyond. Oct. 31, 2003John F. Kennedy Space Center http://www-pao.ksc.nasa.gov/kscpao/snews/snewstoc.htmVol. 42, No. 22 Spaceport NewsA sentimental dedication ceremony was held at the Kennedy Space Center Visitor Complex to honor the crew of STS-107 by adding their names to the National Space Mirror Memorial. Rick D. Husband, David M. Brown, Kalpana Chawla, William C. McCool, Laurel B. Clark, Michael P. Anderson and Ilan Ramon were added to the existing 17 names on the mirror at the Oct. 28 ceremony. The Astronauts Memorial Foundation (AMF) sponsored the ceremony, which saw STS-107 crew member families, senior NASA staff and various legislators attend. Various dignitaries remembered the crew withMirror memorializes Columbia heroesspeeches in front of the memorial, including KSC Director Jim Kennedy, Dr. Jon Clark and Associate Administrator for Space Flight William Readdy. This day belongs to the crew, but most importantly to you, the families of the Columbia seven, said Kennedy. If there is a positive from this tragedy, it is that we all have a renewed appreciation for the risk that the astronauts took and the genuine heroism that they represent. Chairman of the AMF Charles Clemente, U.S. Rep. Dave Weldon and Associate Director of the Johnson Space Center John Young also spoke about the accomplishments of the crew, before Dr. Jon Clark, husband of Laurel Clark, spoke for the crew families. As we stand before this lovely memorial, we must remember that it is not a memorial to the past but a testimony to the future, said Clark. Readdy spoke of how the crew will always be a part of the NASA family. Within the NASA family, the 107 crew was viewed as much more than pilots and engi-Dr. Jon Clark (above), husband of STS-107 mission specialist Laurel Clark, spoke for the crew families at the Oct. 28 National Space Mirror Memorial ceremony while Dr. Stephen Feldman, president of the Astronauts Memorial Foundation, listens. William Readdy (right), associate administrator for Space Flight, and Evelyn Husband, wife of Columbia commander Rick Husband, place a wreath at the Space Mirror.neers, said Readdy. They were people who dedicated their lives to expanding the horizons of the frontier in space. They were our friends and colleagues. Readdy then accompanied Evelyn Husband to base of the memorial to place a wreath. A fly over of the Missing Man Formation was then performed by astronauts currently training at KSC. 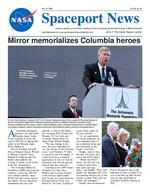 SPACEPORT NEWS Oct. 31, 2003 Page 2 AwardsThis week was a special week for KSC. I want to thank the Astronaut Memorial Foundation for their beautiful and touching ceremony Tuesday which memorialized Columbias seven astronauts on the National Space Mirror Memorial at the Visitor Complex. The event was conducted with the class and dignity these heroes and their families deserved. We will never forget Columbia and her crew, and the dedicated staff at the AMF are a big reason why. Their tireless devotion to the space program is something I admire. I know they had a great deal of volunteer help from around the Center, and my thanks to all for giving us a special day well remember forever. As always, its been busy around the Center. But it was The Kennedy UpdateJim Kennedy Center Director NASA has moved the Columbia Recovery Office (CRO) to Kennedy Space Center. By moving the CRO from Johnson Space Center to KSC, NASA has the storage and coordination of Shuttle debris at one location. Although the volume of calls to report new debris has decreased, with hunting season about to begin in East Texas, where the majority of debris was found, there could be an associated increase in calls. The CRO opened in April and will remain operational as long as call volume warrants. We are still interested in retrieving any debris reported by the public, said Dave Whittle, chairman of the NASA Mishap Investigation Team and head of the CRO. From the standpoint ofColumbia debris finds final home in VABthose calling in, the change should be invisible. Since KSC is the storage location for the debris, and since it is still the Center receiving calls about Challenger, we feel they are the right people to handle long-term support of Columbia calls, he said. The toll-free Columbia Shuttle Material hotline is answered 24 hours a day, 7 days a week. Anyone who finds material believed to be part of Columbia is urged to call the hotline at (866) 446-6603. The CRO operates the Shuttle Interagency Debris Database for data management, record retention and mapping. The CRO will also arrange for larger or potentially hazardous Shuttle debris recovery.The Columbia Recovery Office has moved from Johnson Space Center to KSC. More than 83,000 pieces of Columbia debris are stored inside the Vehicle Assembly Building.wonderful to see people werent too busy to give of themselves to the Combined Federal Campaign (CFC) that ends today. KSCs financial goal of $280,000 was achieved very early in the campaign. While the dollar figure changes daily and the final tally isnt in, at last check we were easily 20 percent to 25 percent above our financial goal. Many charitable organizations that perform great work for people less fortunate than us are directly benefiting from your generosity. While I only officially oversee the civil servant portion of the CFC at KSC, I want to thank our contractor work force for their contributions. The NASA employees dont have a corner on the market when it comes to generosity. Many of our contractors also easily surpassed their financial goals early in the campaign. My thanks to everyone; you should feel great. Its well deserved! Im sure most people know we are in the middle of conducting our work force optimization plan for NASA employees. In a nutshell, this allows us to put the right faces in the right spaces as we support many approaching high priority programs. I appreciate the more than 120 people who have volunteered to be considered for work in areas such as Orbital Space Plane, Return to Flight, Launch Services Program and the NASA Engineering and Safety Center. This is a critical time for both NASA and KSC as we meet the challenges of the future. We hope to have all the personnel actions determined during the next month, with actual movement of people being worked by the affected directorates and supervisors shortly thereafter. Remember, we are doing this to ensure that all of our programs are staffed with the right people to perform our mission If a high quality person is needed to work return to flight, then the directorate losing the position will be granted authority to backfill the position. I truly see this as a win-win for the Center as we improve on what is already the best space agency in the world. On Nov. 10, well host between 600-800 NATO parliamentarians and their families for a one-day tour of KSC. If you see them around the Center that day, please take the time to explain what you do. They are very interested in your work, and its a super opportunity to build a better space relationship with our NATO allies. This is a monumental effort and I appreciate all of the leadership of those in the XA organization, as well as our many volunteers. While youre reading this, I hope to be on vacation with my wife Bernie in the North Carolina mountains, cruising on our motorcycles. I promise to be safe and look forward to seeing you after Veterans Day. . .our work force optimization plan allows us to put the right faces in the right spaces as we support many approaching high priority programs. SPACEPORT NEWS Page 3 Oct. 31, 2003The Business Opportunities Expo 2003 was held Oct. 21 at Cruise Terminal 4 in Port Canaveral, where 157 small business suppliers exhibited their good and services. The event, in its 14th year, also helped government purchasing agents learn what local and national businesses have to offer. In opening ceremonies, KSC Director Jim Kennedy encouraged attendees to walk the aisles and find out what business opportunities NASA has to offer. Let us help you, said Kennedy. We are here to tell you about who we are and what our needs are. We want to work with you because of the beautiful diversity that small businesses bring to our party. The director told the crowd that of the $1.5 billion budget KSC received, nearly one-third goes to the small business community. The small businesses, which make up 99 percent of the businesses in this country, receive from Kennedy Space Center alone approximately $500 million per year, which is a significant jolt to the economy, said Kennedy. According to the director, half of the Gross Domestic Product, which is the total sum of all goods and services provided, is generated through the small business community. That helps you realize how important these 157 small business suppliers are to the success of our program. For information about next years event, contact the KSC Central Industry Assistance Office at 867-7353.Businesses and NASA connect at Expo 2003KSC Director Jim Kennedy (left) opened Expo 2003, sponsored by the KSC Small Business Council, the 45th Space Wing and the Canaveral Port Authority, by encouraging guests to find out what business opportunities NASA has to offer. Below, attendees were able to learn about 157 business suppliers and federal entities who conduct business with NASA. The annual event, in its 14th year, also helped government purchasing agents learn what local and national businesses have to offer. Today is the last day for NASA employees to contribute to this years Combined Federal Campaign. This years goal of $280,000 was reached in 16 days. At press time, employees had raised more than $300,000. I am very proud of the generosity displayed by KSC employees, said KSC Director Jim Kennedy. Our donations will make a huge difference to the many charities that participate in the CFC. This years campaign chairperson, Susan Kroskey, said, I am thrilled over the success of the campaign. It was quite an accomplishment to reach our goal midway through the campaign. Many thanks to all the KSC employees for sharing with others in need. NASA employees can still contribute on-line at http:// cfc.ksc.nasa.gov .CFC quickly exceeds goal Nelson Lauver, host of the nationally syndicated radio program American Storyteller and guest speaker at KSCs first National Disability Employment Awareness Month luncheon, responds confidently when people ask him how he has overcome difficult times. When you get knocked down, get back up, Lauver said. He grew up in a community unfamiliar with learning disabilities, such as the dyslexia he had which wasnt diagnosed until adulthood. Every day, I tell the story of ordinary Americans, which is kind of an oxymoron because there really is no ordinary American, he said at the Oct. 23 event in the O&C Mission Briefing Room. It was much easier to look like the bad kid than the dumb kid. At age 29, he began strengthening his natural talents and rehabilitating his disability. We do beautiful things here at KSC, but theres nothing more beautiful than whats taking place here today, said Center Director Jim Kennedy at the Disability Awareness and Action Working Group (DAAWG) event. He also expressed that he is proud and inspired to be part of a Center dedicated to making fellow employees lives better.Luncheon serves to promote disability awarenessDuring the luncheons special entertainment portion, Dorothea Kuzma forced her boss, Russell Romanella, deputy director of ISS/Payload Processing, to not only eat his dessert, but wear it, too. Page 4 SPACEPORT NEWS Oct. 31, 2003 The sixth annual Spaceport Super Safety and Health Day held Oct. 15 reinforced our commitment to safety and gave employees a chance to hear motivational speeches and tour vendor exhibits. The event kicked off at the Training Auditorium with remarks from Center Director Jim Kennedy. Im impressed with the importance that Kennedy Space Center places on safety, said Kennedy. As I tour our Center and some of the difficult environments our people find themselves in, I am impressed that safety is so critical. I would like to reinforce the importance of safety from the perspective that every one of you matter. If you feel the need, and I want you to feel the need, share whats on your heart with us. If its not safe, say so. U.S. Air Force Maj. Gen. Kevin Chilton, who has flown on three Space Shuttle missions, also talked about safety in an organization. I think organizations that have excellent safety programs have individuals throughout the organization who have taken safety on as a personal charter, he said. They have adopted a safety attitude, and its not one that they turn on when they come up to the gate. Its one that is so internalized that they take it home with them and live it every2003 Spaceport Super Safety and Hea l day with their families. Keynote speaker, Capt. J. Charles Plumb, U.S. Navy Reserve retired, then talked about the importance of safety and how people need parachute packers. These are the people that prepare us for difficult situations and help keep us out of harms way. So many people depend on you to be safe in the workplace, said Plumb. So the question becomes, How is your parachute packed? This means your mental parachute, including the skills of your craft, your emotional parachute and your spiritual parachute. Plumb then talked about his days as a prisoner of war and how he got through it. This years event was coordinated by Conrad Nagel, chief of the Shuttle Project Office. The KSC and 45th Space Wing Spaceport Super Safety and Health Day team provided the energy and commitment for an excellent day, he said. Our speakers had a message of encouragement and challenge for our government and contractor organizations as we work toward Space Shuttle return to flight. Everyone had a super time of fun and reflection on safety and health, and I can say that it was a very exciting day, one that I will never forget, said Nagel.Many vendors and organizations displayed their products during the Spaceport Super Safety and Health Day at KSC and Cape Canaveral Air Force Station, an annual event dedicated to reinforcing safe and healthful behaviors in the work force. Page 5 SPACEPORT NEWS Oct. 31, 2003 Above, a Florida Power and Light employee shows what can happen when an aluminum ladder rests against a live wire. Left, before the start of the kickoff presentation for Spaceport Super Safety and Health Day, Center Director Jim Kennedy (left) talks with guest speaker Capt. Charles Plumb (USNR retired) and United Space Alliance Vice President and Deputy Program Manager, Florida Operations, Bill Pickavance (right). Below, a security officer gives a canine demonstration by a tent near the Operations and Checkout Building. Center Director Jim Kennedy (right) presents a plaque of appreciation to Conrad Nagel who organized the Spaceport Super Safety and Health Day at KSC. Nagel is chief of the Shuttle Project Office, Shuttle Processing. Above, employees file around displays near the Vehicle Assembly Building. Below, workers check out vendors in Hangar S at the Cape Canaveral Air Force Station during the 2003 Spaceport Super Safety and Health Day. l th Day Is your parachute packed? Oct. 31, 2003 SPACEPORT NEWS Page 6 Recognizing Our PeopleThe Kennedy Space Center Biannual Awards Ceremony was held Oct. 22 in the IMAX Theater at the Visitor Complex. The following is a list of award winners.Outstanding Bravery Medal James Langenbach Geosyntec (see Sept. 19 Spaceport News ) Outstanding Secretarial/Management Support Assistant Award This award recognizes individuals within the secretarial/clerical field who have demonstrated exemplary performance of official duties, who possess high personal integrity, judgment and responsibility as well as having established and maintained rapport with others. Charlotte Beauchemin QA Tammie Hines TA You Make A Difference Award This award recognizes employees who have set examples of high energy and who are team players. These individuals reach out beyond their immediate organization for the good of the Kennedy Space Center and the community. Connie Sanchez AE Isolda I. Galiana-Liang IT Pamela J. Adams XA Timothy S. Barth YA Virginia F. Whitehead UB Certificate of Appreciation This award recognizes significant contributions by Kennedy Space Center civil servants, contractors, public organizations or individual citizens to Center endeavors. Taya R. Facemyer YA Carol M. Aiello JP Jose Alonso Jr. UB Dennis W. Armstrong XA Dr. Stanislaw Augustynowicz ASRC Joe Bartoszek  XA Individual Awards David N. Bellemore The Boeing Company In recognition of tireless and unrelenting efforts for the safe and expeditious delivery of the Japanese Experimental Module and Node 2 to the Space Station Processing Facility at KSC. Group Awards In recognition of the exceptional achievements, exemplary customer support, demonstration of teamwork and a commitment to excellence for providing numerous secure Information Technology service capabilities to the Kennedy Space Center and across NASA. Michael S. Bauman, Mark A. Bradley, Frank W. Dodd, Thomas W. Fornoff, Gerald A. Ludwig, Karin I. Nicholson ASRC Jon Bauschlicher  VA In recognition of the outstanding creative design and professional graphics services provided in support of the 2003 Florida LaborManagement Conference. Richard A. Beard, Beverly A. Bragg, Lynda S. Brammer, Elaine J. Davis, Jerome L. Forney, Amy D. Lombardo, Paul Michael Marks, Richard F. Murrey, Cheryl L. Patronsky, J. Bennett Wight, Cynthia Wimberly InDyne Indiviudal Awards Larry Benninger Analex Corporation In recognition of continuous high standard of engineering and performance which merits the respect and appreciation of the entire NASA Atlas V Launch Team. Hector A. Borrero UB For outstanding dedication and leadership in assuring the successful assembly of International Space Station truss elements. Danom M. Buck The Boeing Company For demostrated outstanding dedication and leadership in support of International Space Station truss elements. W. Bruce Buckingham XA For exemplary professionalism and dedication to NASAs space program, ensuring an accurate and compelling NASA story reached the American public and space enthusiasts worldwide. Juan P. Calero UB For outstanding dedication, professionalism, attention to detail and exceptional achievement as the Electrical Power Systems engineer for the Node 2 Integrated Systems Test and related problem report troubleshooting, isolation and disposition. Dr. Carlos I. Calle YA For leading a proposal team that, along with the University of Arkansas at Little Rock, won the first Office of Space Science NASA Research Announcement ever awarded to KSC. Erin L. Campbell GG For professional performance, enthusiasm and personal dedication in the preparation of the monthly reporting requirements. Robert E. Castlen Wyle Laboratories In recognition of outstanding efforts in providing Nondestructive Evaluation Computer Tomography support on the Joint Base Operations and Support Contract to the Columbia Accident Investigation Board. Penny L. Chambers CC In recognition of dedication and support to the Kennedy Space Center Office of the Chief Counsel. Barry N. Chefer JP For exemplary teamwork in master planning integration of the Cape Canaveral Spaceport and its mutual benefit to the 45th Space Wing, KSC and Spaceport Florida Authority. Lou DeSalvo Analex Corporation In recognition of contributions to the Space Launch Initiatives, Next Generation Launch Technologies and Orbital Space Plane programs in the areas of Risk Management and Reliability Analysis. George Diller XA For exemplary professionalism and dedication to the NASA exploration mission and diligence in ensuring that the NASA story reached audiences around the world. Michael T. Downs GEM Technologies In recognition of exceptional achievements and significant contributions to the KSC Telescience Lab and in developing new capabilities for the remote testing of Space Station payloads and Expendable Launch Vehicle systems. Loretta A. Dreier BA For excellent contribution in leading the initiative for the rollout and implemention of the NASA On-line Registration System at Kennedy Space Center. Contractor of the Year Awards KSC Large Business Prime Contractor of the Year OAO Corporation KSC Small Business Prime Contractor of the Year Analex Corporation KSC Small Disadvantaged Business Subcontractor of the Year All Points Logistics, Inc. KSC Woman-Owned Small Business Subcontractor of the Year Spherion KSC Small Business Subcontractor of the Year East Coast Power, Inc.